As you already know, the primary purpose of a gun safe is to keep your firearms protected from theft and unauthorized people, like kids, from getting in. Beyond the above apparent reasons, a gun safe should be sealed to keep your guns in good condition and secure against fire, floods, or other natural disasters. The condensation is caused by excessive humidity, i.e. moisture in the atmosphere and that undesirable phenomenon is, in particular, enhanced if you live in a humid area or store your safe in places with significant temperature swings like a garage or basement. 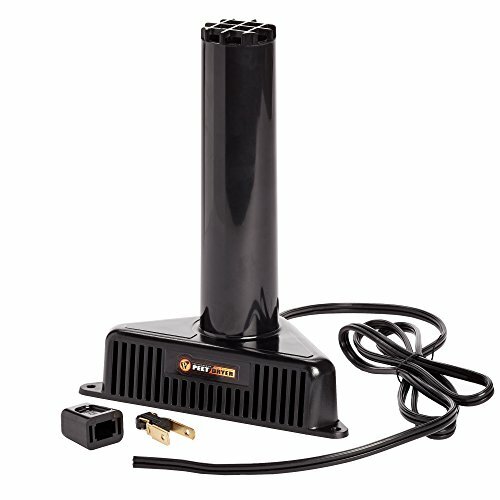 In this review, we're going to discuss the top dehumidifiers for gun safes and outline which models stood out and why. While the airing method can provide decent results, the absolute best way to keep the moisture out of your safe and protect your guns from humidity is to use a dehumidifier. Keeping the moisture levels in your safe at an optimum level keeps corrosion from rusting your gun parts. It maintains humidity at a level low enough to prevent damage to the wooden parts of a gun. Additionally, it inhibits the growth of mold and mildew. Using a dehumidifier will prolong the shelf life of your ammunition by quite a bit. Over time, man has developed and introduced many resources to fight moisture in his home. You can use DIY options like dry rice, calcium chloride, or baking soda, but we strongly recommend using an actual dehumidifier to keep moisture and mold out of your safe. There are two types of dehumidifiers commonly used today, known as electric and desiccant dehumidifiers, and each of them will provide varying levels of humidity reduction. Electrical dehumidifiers are large resistors inside a tube, which work by heating the internal temperature of the safe to several degrees above ambient temperatures, thus enabling the relative humidity to go down. That way, the dehumidifier prevents dangerous changes in temperature that can cause condensation and dew point conditions. Whereas this option is maintenance free, it requires power. In the event your safe comes with an internal electric outlet or a hole to run wires through, you should only have to route the cord end through the hole, attach the included plug to the end of the cord and simply plug it in. However, if you purchase a safe without the electrical provisions, it means you will need to drill the safe to allow the cable to pass. Also, make sure the hole on the bottom of the vault serves to anchor your safe to the cement floor and isn’t used to run wires. These dehumidifiers work quite differently than the electric devices. Instead of heat that creates a consistent temperature inside safe, the desiccant dehumidifier absorbs surrounding moisture like a sponge, keeping the interior nice and dry. Unlike an electric dehumidifier, desiccant dehumidifiers are manual, require no power, and can be reused for several months if you choose a good brand. They can be the disposable type (one-time use) or rechargeable. The most common desiccant dehumidifiers use silica gel made from sodium silicate, which captures the water with their silica gel beads. The featured warning label stating `Do not eat`, means that silica gel should not be ingested by humans or pets, as it is a poisonous substance. The reusable desiccants must be dried out periodically in your oven or direct sunlight, but you should monitor them occasionally to make sure they haven't reached moisture capacity. While the electric dehumidifiers are more popular among large gun safe users, desiccant dehumidifiers are best for small safes. 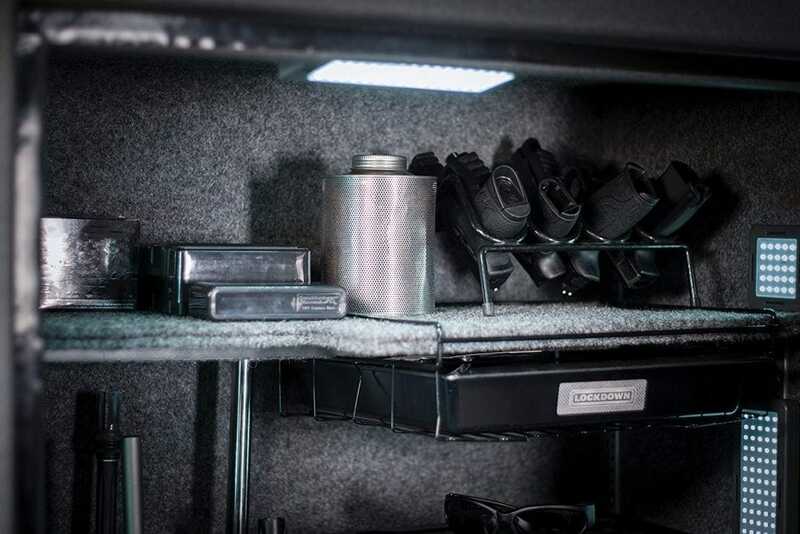 Moisture absorbers and dehumidifiers are very helpful in gun vaults due to keeping moisture levels low and absorbing any bad odors that might be lingering in your safe. But depending on your safe, before purchasing, you should look for some crucial features in a dehumidifier that will work help you decide which is right for you. As a rule of thumb, when it comes to dehumidifiers, larger safes stay dry better with the electrically heated rod dehumidifiers and for smaller ones, silica gel dehumidifiers will work successfully. Take the size of the vault into account when buying a dehumidifier for your gun safe, because it's something that's easily overlooked. The effectiveness of a dehumidifier is closely linked to its coverage ability and you should always check the product description to know just how many cubic feet the dehumidifier will cover. As usually happens on the market, most of the more expensive dehumidifiers offer better coverage, which is more appropriate for large gun safes. Of course, you can always choose to buy two dehumidifiers to cover the safe adequately. For example, if you have a gun safe without provisions for the electrical outlet, it is more practical to use two or three mini silica dehumidifiers. The electric dehumidifier prevents condensation by controlling the temperature and is perfect for humid environments, but it has to be plugged into a power source and requires an outlet near the safe. Modern, upper-grade gun safes usually come with the electrical provisions already made, so you just need to place the cable through the hole and connect it to the electric socket. On the other hand, desiccant dehumidifiers are a less sophisticated way of removing moisture from your safe, but they are wireless and require no electricity in order to absorb moisture. The majority of gun owners prefer the cordless desiccant dehumidifier since it only requires you to simply place it in the safe and monitor it from time to time. The silica gel dehumidifier removes all the moisture from the air and, depending on its capacity, should be drained or recharged when the silica gel beads are fully saturated. Those uncomplicated, straightforward models use colors in the beads, while more sophisticated dehumidifiers have an indicator on the body housing that changes color to show you when the dehumidifier has to be recharged or reactivated. Depending on the construction, there are dehumidifiers that rely on silica gel beads and electric dehumidifiers which need access to a power source. Because the first type doesn't run on batteries or require any electricity, all the installation they need is to simply place them inside the safe. The other type, in the form of an electric dehumidifier rod, may be more demanding than the first one. If your gun vault boasts pre-drilled holes for access to electrical outlets or has an electrical outlet built in, it will be easy to plug in an electric safe dehumidifier. If your gun safe comes without holes, it is strongly recommended to contact the maker to see where it's safe to drill without damaging the gun vault and lowering its security. Some dehumidifiers are easier to maintain than others. For example, electric dehumidifiers are more expensive but they do not need much or only minor maintenance. Silica gel dehumidifiers are more affordable and have an easy installation, but they might require slightly higher maintenance than electric models. The silica beads will eventually become saturated during use, and you will need to recharge them. You should select a model that is easy to reactivate whenever it is needed. Fortunately, there are two common ways the moisture can be cooked out of the dehumidifier. Depending on the model, you can recharge your moisture absorber by heating it in your kitchen oven or dry them in direct sunlight for about five to six hours. If you have a more advanced model, then it should be plugged in into a power outlet for reactivation and when the beads turn from blue to pink the unit is ready for use again. There are many dehumidifiers on the market to choose from and we hope you will find an adequate one to meet your gun safe standards from the following list. With more than 40 years of experience in the gun accessories market, it is no wonder that Lockdown Safe & Security ACC. sells some of the most popular electronic dehumidifiers out there. Their dehumidifier is a heated rod type and, depending on the inside width of your safe, you may select from 12", 18", 24" and 36" long models. For this guide, we have chosen the 12" long Goldenrod dehumidifier which will cover an area of up to 100 cubic feet. It utilizes a sealed, electric element to safely heat the surface temperature to no more than 150 degrees F (65°C). While that steady, museum quality temperature is a little too hot to hold it, with careful size selection GoldenRod cannot overdry an area, but it will reduce the relative humidity and prevent condensation on your firearms. 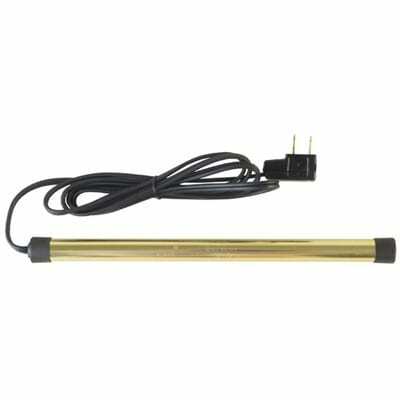 The GoldenRod Original Dehumidifier comes with universal mounting brackets, a six-foot cord, and an unattached plug. If your safe has a pre-drilled hole for the power cord, it will take around ten minutes to complete the setup. It is recommended that for the best performance you should buy the longest unit that fits horizontally and should be installed in the very bottom of the safe to set up air currents that keep the air flowing from bottom to top.Placing a long hot rod vertically would be less effective than using a short dehumidifier across the safe base. In other words, you should purchase the size that is closest to the width but leaves between three to four inches of room to spare. The GoldenRod is excellent, as it comes with a lifetime guarantee. 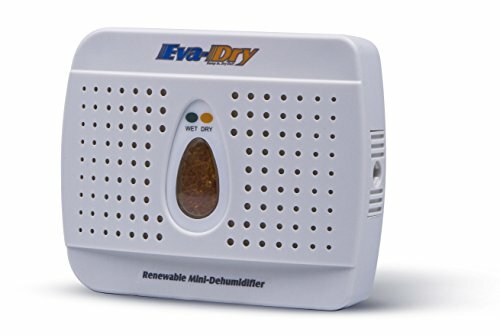 One of best gun safe moisture absorbers is the Eva-dry E-333 Renewable Mini Dehumidifier. This powerful, low-maintenance dehumidifier is based on silica gel technology and belongs to the group of desiccants that absorb moisture and can be used over and over again. As its name says, the E-333 model works in areas up to 333 cubic feet, i.e.it will be enough for a maximum area of 10'x 10'. While it operates silently, the principal advantage of the Eva-Dry E-333 is that it absorbs moisture without the need of batteries or a power cable to be fed into the safe. As a hassle-free product, your only responsibility would be to check every three to four weeks color of the crystals to determine when the crystals need to be changed. An indicator window at the front of the unit contains crystals that will change from orange (when dry) to green (when wet) to indicate when the unit needs to be "renewed". The saturated crystals will absorb approximately four to six ounces of moisture and after the crystals have changed to green, E-333 is ready to be plugged into a standard electrical socket for eight to ten hours in a well-ventilated area. After that period, the indicator window will change back to orange and the dehumidifier is ready for use. Although the manufacturer offers this model with a five-year warranty, its expected life span is around ten years. Since 2016, the Eva-dry has omitted harmful ingredients and improved their dehumidifier with a non-toxic orange indicator which is much more environmentally friendly. Whereas the popular GoldenRod is for those people who have a larger gun safe and live in a humid region, the cheaper Lockdown dehumidifier would be perfect if you keep your gun safe in the garage. The LockDown Gun Safe Dehumidifier is available only in two sizes, 12 inches and 18 inches and ships disassembled and with mounting brackets. The included bracket enables you to mount the rod horizontal and low in your gun cabinet for the full effect. Since the Lockdown Dehumidifier Rod functions by slightly increasing and maintaining the air temperature to 120 degrees Fahrenheit (49°C), this temperature is not hot enough to ignite the carpet materials or items contained in the safe. On the other hand, the rod may be hot to the touch but without danger of causing a fire. 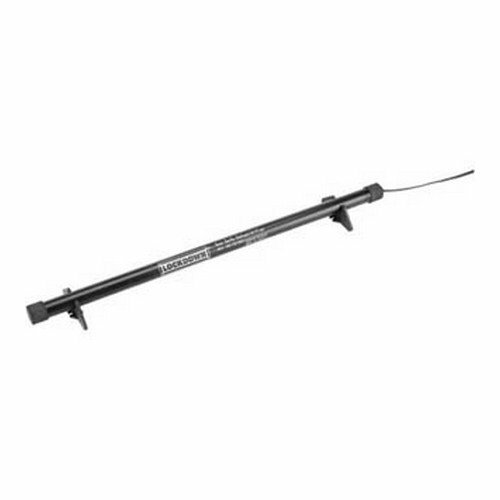 The Lockdown 12" dehumidifier rod comes with a six-foot-long cord equipped with a quick plug attachment to reach external power supplies easily. However, this plug is of poor quality, so it is recommended to purchase a better plug from a hardware store. 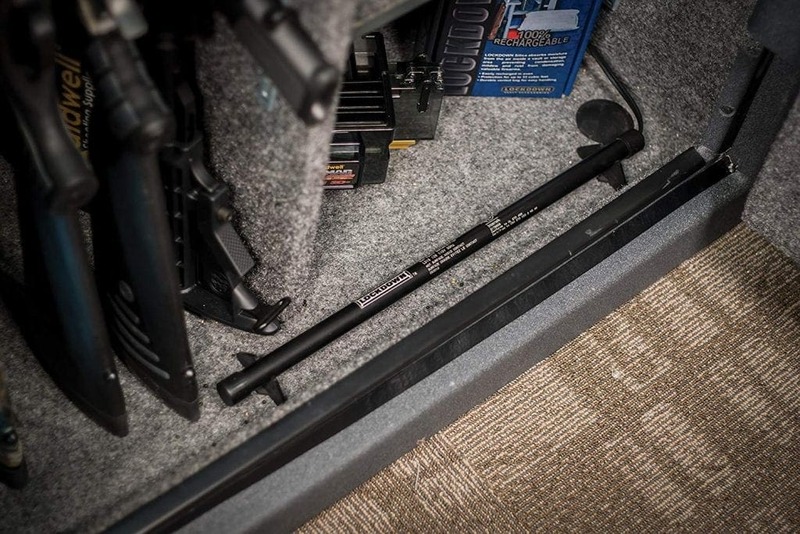 Model 222666 has a 12-inch long rod and it dries about 100 cubic feet of area or gun safes that range from 18-36 guns. This hot rod dehumidifier consumes eight watts of power at 120 volts and comes with a one year warranty. 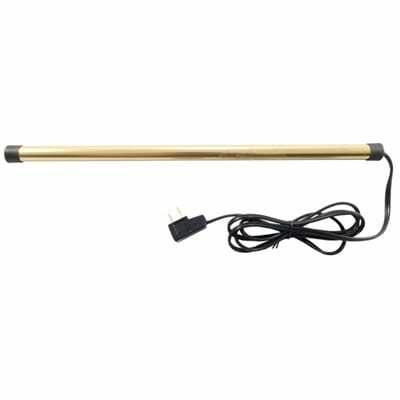 If you have a small gun cabinet with a hole to run a cord and are looking for an inexpensive electronic rod, this offer should cover your needs. As a safe manufacturer, a Stack-On company made this desiccant dehumidifier specifically for gun safes or security cabinets. The SPAD-1500 has gel beads that absorb moisture and change color to indicate when they need to be recharged. This model utilizes a monitor and control panel on the front which shows when it needs to be recharged. 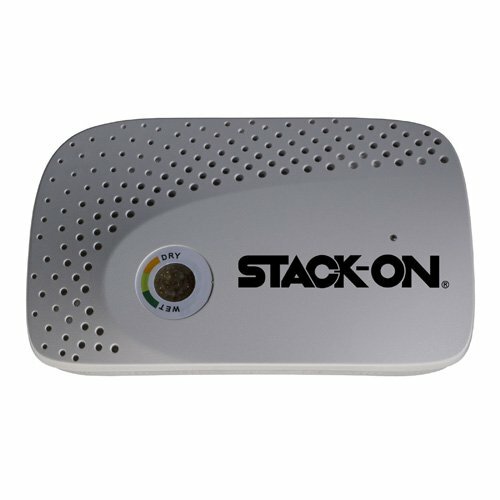 When the moisture indicator turns dark green that means it has absorbed a lot of moisture and the dehumidifier needs to be recharged. To charge, plug the dehumidifier into a power socket for 12–15 hours in a well-ventilated area. The unit is ready to use again when the beads in the moisture gauge turn orange. One caution, the unit can get extremely hot when charging, so wait about 15 to 30 minutes before picking it up. The SPAD-1500 can excellently remove moisture from 100 cubic feet for up to six weeks before recharging. For best results in your safe, an optimal position of this mini dehumidifier would be on a high shelf in your long gun safe. 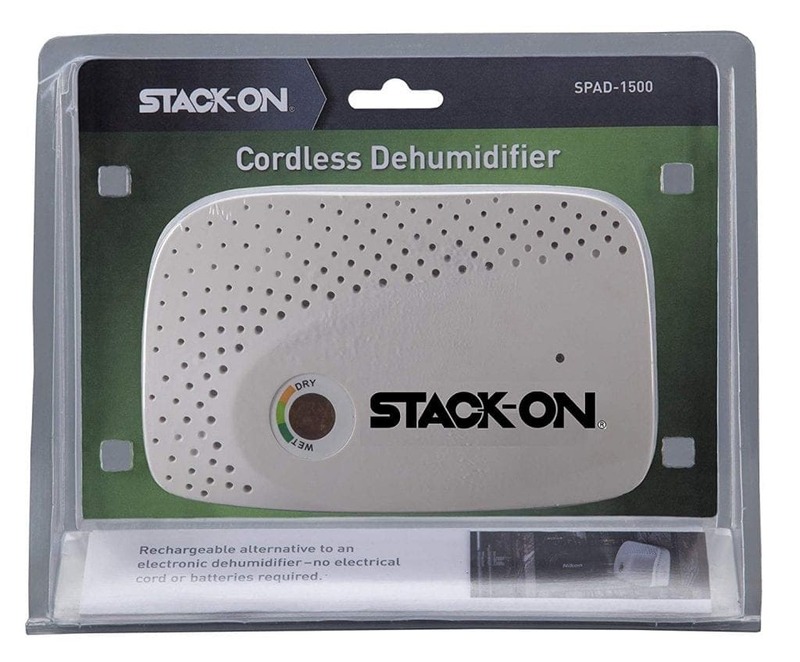 The Stack-On SPAD-1500 Rechargeable Cordless dehumidifier is a small, compact device, which doesn’t require wires, so you will not have to drill holes in your safe. At the same time, the option to charge it overnight through a plug in the wall makes it much more convenient than a simple can of gel. Another name with a long tradition in the industry is PEET Shoe Dryers, a company known for their drying products, such as dryers for boots and gloves. Unlike standard electronic rods, PEET’s 15-watt dryer utilizes thermal convection technology where the air is drawn in through the vents at the base of the PEET Dryer, warmed slightly, and circulated throughout items being dried. Since there is no fan, you don’t expect any noises or a noticeable amount of airflow, the heat merely rises from the top of the dryer. The SafeKeeping Dryer is designed to effectively remove humidity that causes mildew, rust, and even odor from gun safes and cabinets. This PEET device quietly removes damaging moisture from safes and cabinets without excessive energy effectively drying up to 80 cubic feet. Although the PEET dryer works similarly to the rods by using heat to keep moisture out of your safe, its gentle, almost imperceptible circulation of warm air causes some users to complain about the lack of indicator light. Another bigger gripe refers to the cheap cord and plug. The PEET Dryer is maintenance-free and comes with five-year warranty. A Lockdown dehumidifier contains silica gel beads to capture the moisture that builds up in gun safes and cabinets. As you may guess, the Lockdown Silica Gel does not require an electric outlet or power to remove humidity from the air. Featuring a different design than conventional dehumidifiers, a Lockdown silica gel desiccant comes with a large volume of 750 grams in a canister for more moisture absorption. 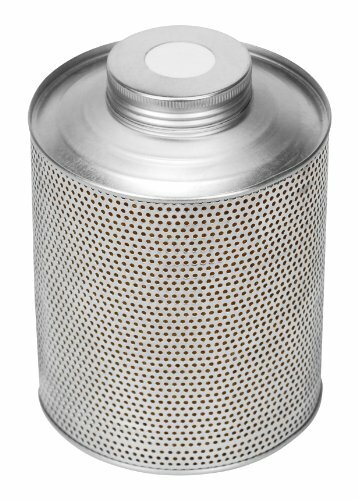 The sturdy perforated aluminum can is full of silica gel that can be recharged right in your oven at around 325 degrees Fahrenheit (162 °C). When you buy the Lockdown can, it has to be recharged prior to putting it in your safe. The Lockdown silica vented can absorbs moisture from the air and protects up to 57 cubic feet making it perfect for small safes. Moreover, this silica desiccant relies on a visual indicator that turns from dark blue to orange when it is full of moisture and ready for reactivation. Though the recharging by the oven method is very slow and takes at least double the amount of time as the instructions claim, some customers pour out the beads on the baking sheet or use the microwave to speed up the process. The relative humidity is expressed as a percentage and it’s measured with devices called hygrometers (humidity sensors) or cheap "weather stations". Although some would assume it is best to have no humidity in your safe, actually, the humidity levels shouldn't be allowed to drop too low, below 50%. While documents and metal parts would probably benefit from 0% humidity, on the flip side the ammo would dry out and the wood stock of your firearm would also begin to dry out and become damaged. In the end, it is worth pointing out that you should try to keep the relative humidity in your vault at 50% humidity and at a stable temp of 60-70F (15-21°C) as ideal conditions in your gun safe.